In case folks inquire, we had a new record Wisconsin high of 192 nesting pairs of Trumpeter Swans in 23 counties. Approximately 45 percent of nesting pairs occurred in two counties: Polk and Burnett in northwestern Wisconsin. In 2010, there were 176 nesting pairs in 24 counties, and in 2009, the former nesting peak was reached at 183 in 23 counties. So, we continue our upward trend, but who’s counting? This was our 25th year of the Trumpeter Swan Recovery Program, which has come a long way since our returning Board member, Becky Abel, helped with cross-fostering back in 1988 and then started her Master’s work on decoy-rearing in 1989. We fly the next few weeks to get a good handle on cygnet survival to fledging. This summer, we again marked 100 cygnets during our roundups, thanks to the support of scores of volunteers, including about 20 interns from the International Crane Foundation in central Wisconsin. Pat Manthey continues to coordinate field activities in northern Wisconsin, while I handle duties in central Wisconsin. I concluded my fund-raising activities for the swan program, and we have sufficient funds for one more season of field work. This will complete my post-delisting obligation to the state’s Natural Resources Board for annual monitoring of nesting swans. 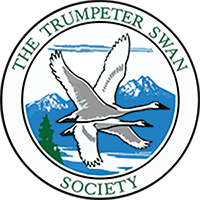 Pat and I will have a 2-day retreat later this fall to chart a new course for the Department of Natural Resources for future swan monitoring, and I suspect that after next year, coordinated, statewide surveys of Trumpeters will likely occur once every 10 years. From Peg Abbott, Outreach Coordinator of TTSS: Fascinating footage of recent capture and banding efforts can been seen on two YouTube videos, one from the perspective of a kayak paddler and another from land. I can tell you the kayak paddlers got a workout!